One of the worst freight wrecks that has occurred on the Great Northern in a long time took place west of Ephrata, near Soap Lake station, Wednesday morning about nine o'clock, when an east-bound freight train of seventy-odd cars drawn by one of the big Mallette engines went off the track and piled some fifteen cars, partly covering the engine. Cars of oil which were in the wreckage took fire and some fifteen loaded cars and the engine were destroyed. 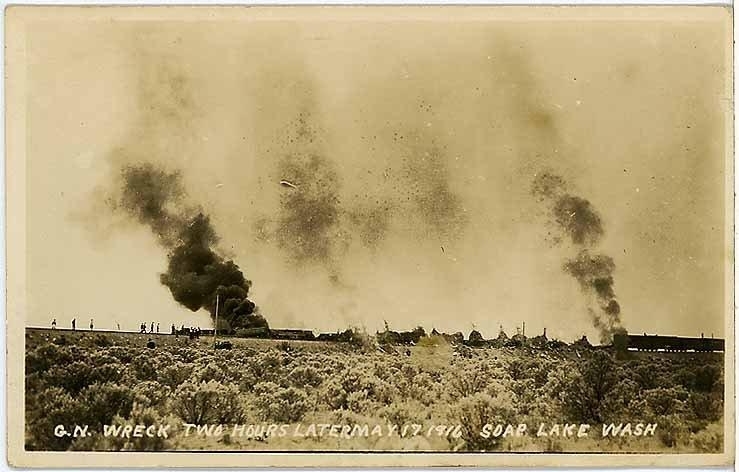 The train crew blew up several cars with dynamite to break the contact and thus saved the balance of the train. The wreck was caused by the track repair men having removed rails and failed to put up a warning sign as the rules provide. Fortunately no one was hurt. The engine men having had time to jump. The arrival of trains No. 1, due here at 2 a. m. and 43 due at 3:45 was delayed eleven hours. In the destruction of property and loss to the company the amount will figure up over a hundred thousand dollars. The engine, which was covered with oil and wreckage, is declared by railroad men to be a total wreck, the heat having bent and twisted the iron out of shape.